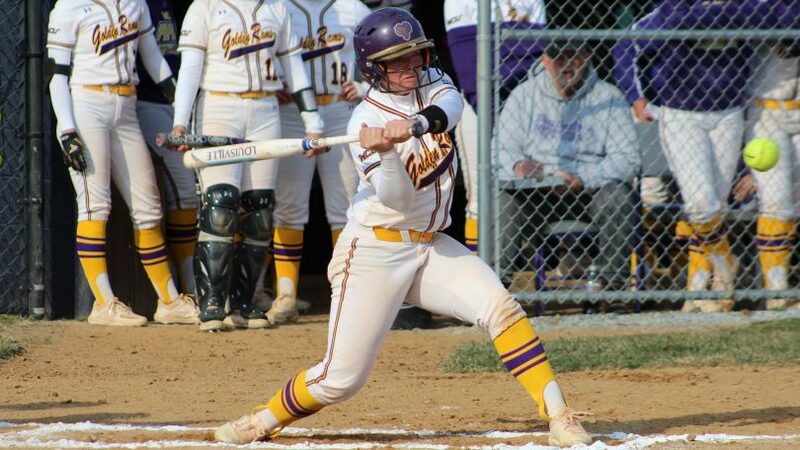 On Saturday afternoon, Golden Rams’ junior second baseman Bri Garber (Willow Street, Pa./Lampeter Strasburg) registered her 200 career hit, becoming the seventh Golden Ram to do so. Behind the second baseman’s bat, the Golden Rams (26-15, 7-3 PSAC) ended the week on a good note by winning the second game of their doubleheader Saturday against PSAC East rival Kutztown University (27-14, 6-4 PSAC). With the win, the Golden Rams have positioned themselves in first place among the PSAC East standings, holding a one game lead over Kutztown. Needing just one hit to join the illustrious 200 hit club, Bri Garber added yet another milestone to her impressive resume on Saturday. Garber has been nothing short of spectacular since joining the Golden Rams as a freshman three years ago when she was named PSAC East Freshman of the Year. Last season, Garber appeared and started in all 60 games, leading the PSAC in six offensive categories (BA, AB, R, H, BB, OB percent). Garber’s PSAC-best 59 runs ranked 12 in NCAA Division II, her PSAC-best .436 batting average ranked 31 in all of Division II and her 85 hits set the school’s single-season record. Last season, Garber was also named DII CCA honorable mention All-America, DII CCA All-Atlantic Region, DII CCA Atlantic Region Player of the Year, NFCA All-Atlantic Region, All-ECAC first team, All-PSAC as well as the PSAC East Player of the Year. Garber and the Golden Rams will need to keep that same energy the rest of the way. The Golden Rams went 4-2 this past week and cannot afford a slip-up with three of their next four opponents being conference matchups. Last Sunday, the Golden Rams split a doubleheader against conference opponent East Stroudsburg (21-19, 4-6 PSAC). West Chester dropped game one 9-4 before coming back to win game two by a final of 3-1. On Friday, the Golden Rams swept Millersville University (20-25, 3-7 PSAC) as they rolled to a 6-0 game one victory before using a 10-run seventh inning to earn the game two victory by a final score of 13-3. And, of course, this past Saturday, the Golden Rams split their doubleheader with Kutztown as West Chester dropped game one 9-5 before rebounding to capture the second game 2-0. The Golden Rams’ next matchup will take place next Friday, April 19 at home against East Stroudsburg.